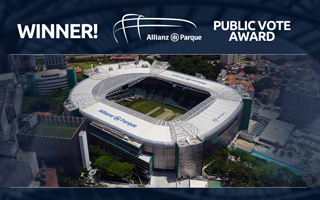 Stadium of The Year Public Vote: Winner – Allianz Parque! With over 100,000 users from Brazil you might think one of the World Cup stadiums might grab first place. Well, not this time! Already before this year’s competition we knew Brazil will be a country well-represented in our Public Vote because of the spectacular World Cup stadia. After all, never before have there been 8 nominees from one country. Still, by far the most supported new stadium in Brazil turned out to be the one opened after the FIFA tournament had long gone. Allianz Parque was occupying one of three top spots nearly all the time, from day one. And that result was achieved without any campaign to support it. In fact, it wasn’t until the last few days that the stadium itself promoted the vote via one facebook post. A magnificent sign of support from Palmeiras supporters and not only them. The stadium also received significant number of points from voters in Europe and beyond. The final number of points is stunning: 134,725 is more than all previous winners received combined (!!!). This means one out of three voters chose this stadium in their 'top five' selection. Altogether people from 95 countries indicated Allianz Parque as one of their favourites, obviously primarily from Brazil (25,223). The new home of Palmeiras was also supported by 1,882 Russians, 1,416 Turks, 890 residents of USA and 778 Poles. The new stadium in Sao Paulo had to match high expectations of a century-old Palestra Italia. It also had to fit within the extremely tight location it had to occupy. The challenge was faced very well. Bruno Campos, architect of the redeveloped Mineirao: "An extremelly compact and efficient Arena "squeezed" in a dense consolidated area in São Paulo, the Allianz Parque is designed to be adaptable for many types of events, dealing successfully with an existing structure and challenging urban conditions."